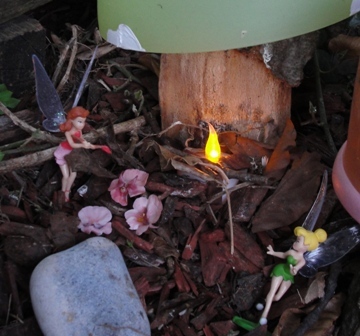 The fairy toadstools in our butterfly garden have recently had new visitors. They seem very content with their new homes & are more than happy to share their space with a friendly gnome. Minnie has checked them regularly & been a great host; collecting food for them (seeds), making blankets (leaves), & even making them a pebble path so they don't get wet feet on their journey home! It's been great to see her incorporating so many natural objects in her play. 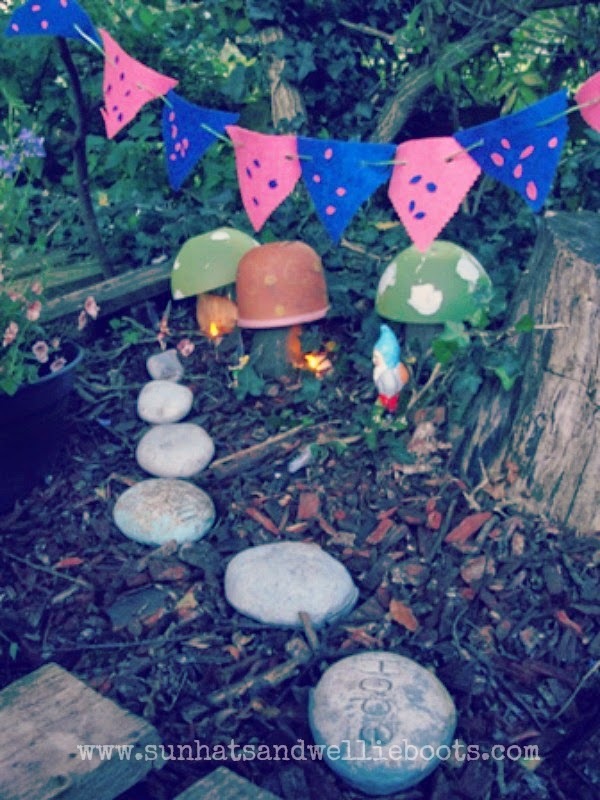 After seeing the bunting we've had up in our garden over the summer she was keen for the fairies to have some too. 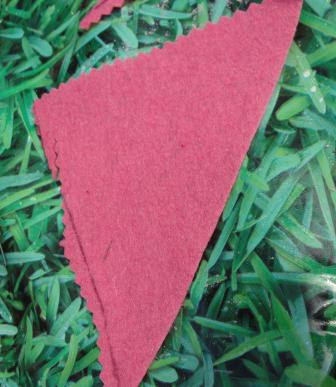 I drew several triangles on pink & blue felt which we found in our craft box & Minnie cut them out. She's showing a real interest & skill with scissors & can follow outlines pretty well. 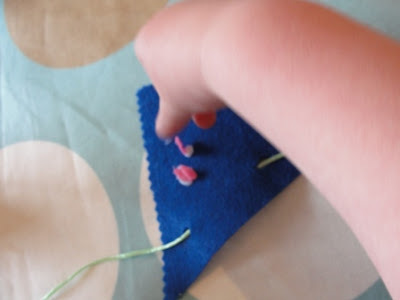 She chose to use my pinking sheers to cut her bunting (I'd been using them the other day & I think M was intrigued by the pattern they made). 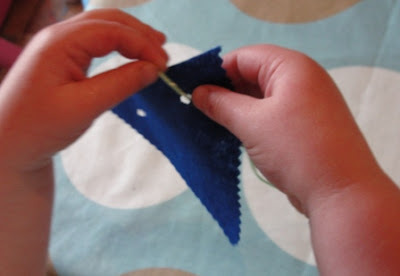 They were a little heavy for her to manipulate but they did enable her to slowly follow the template on the fabric. 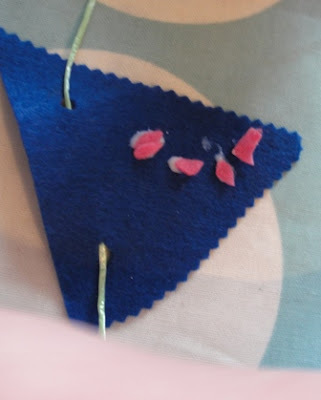 I tried to punch holes in the fabric for the string to thread through but the felt was a little too thick, so finished the holes using scissors. 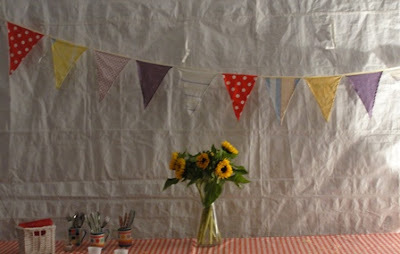 Minnie then threaded each triangle on to make her bunting. 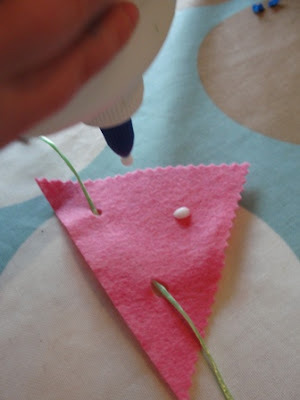 She decorated the flags with small shapes that we had cut out of the scraps of felt & some PVA glue. 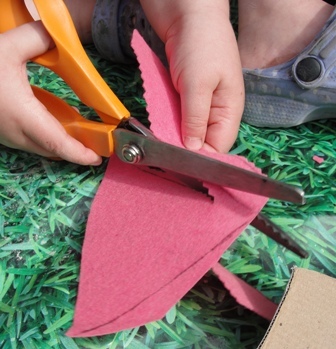 Once dry they were ready to decorate the fairy hamlet! 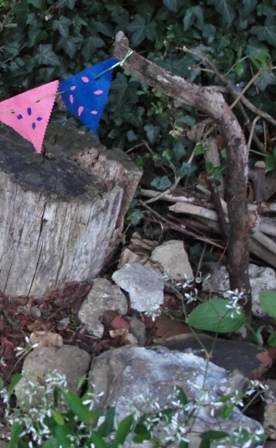 Minnie found a couple of small branches which made great posts for her line of bunting. 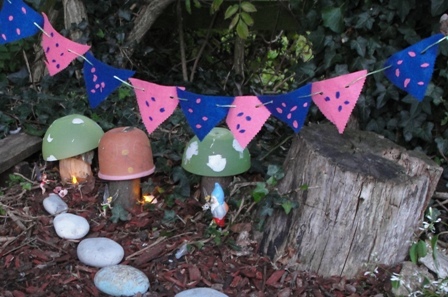 It was early evening when we set up the bunting & the fairies were just lighting up their homes. (I hid battery operated tealights under a few leaves to get the effect.) The toadstools looked very cute gently glowing in the garden as dusk fell. Minnie said she even heard the fairies say "Thank you!"